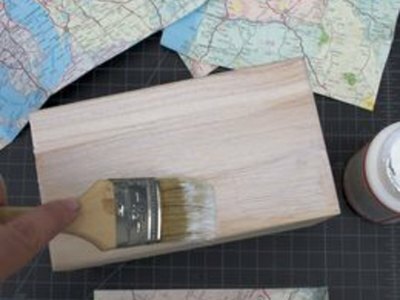 Decoupage is a simple technique that lets you add custom designs to almost any surface -- wood, glass, terra cotta and most plastics are great surfaces for decoupage. Use a solid sheet of decorative paper to cover a tray or box, or create a collage using magazine clippings, cuttings from photos or random shapes. 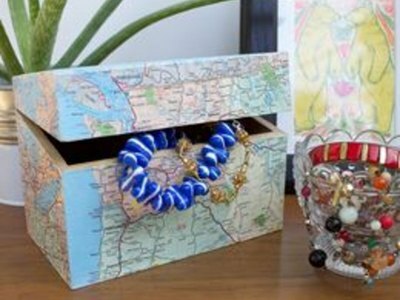 This project demonstrates how to cover a wooden box with an old map to use as a jewelry box! 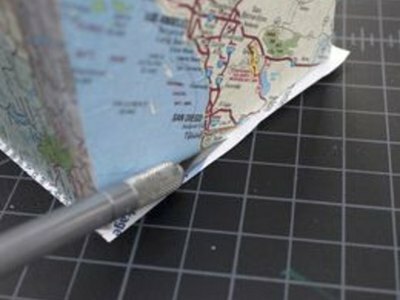 Any type of paper works great with decoupage. Tissue paper can be beautiful but fragile, so use with care. Decoupage medium comes in several different finishes including matte and glossy. Choose whichever fits your style! Please see the last slide for an itemized list of tools and materials. Clean your surface with a damp cloth to remove dust. Unscrew hardware with a small screwdriver and save it for later. Trace each side of the box onto the paper. You can use a single pattern piece for each side, or rotate the box on the paper as you trace for a continuous pattern. Add 1/8 inch to each edge for overlap. Cut out all pieces using scissors or a utility knife. 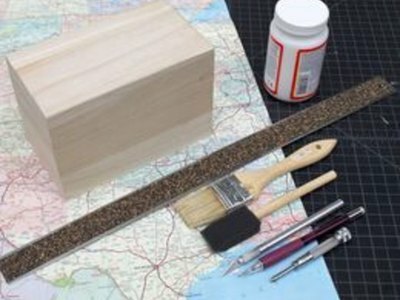 Paint a thin layer of decoupage medium onto one side of the box using a brush. Cover the entire surface and smooth out heavy brush strokes. Don’t use too much medium or your paper may wrinkle. Wait approximately 20 seconds for the decoupage medium to become tacky. Lay the paper on top of the medium and smooth with the palm of your hand. Use your finger to smooth out any bubbles starting at the center and move outwards. 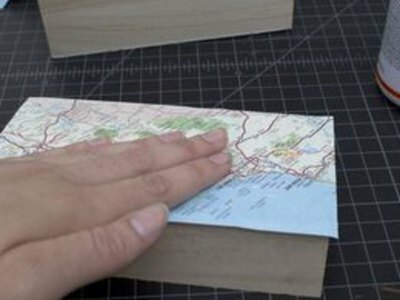 Fold the excess paper over the edges of the box and paste down with decoupage medium. This will ensure that you will not have any gaps in your design. 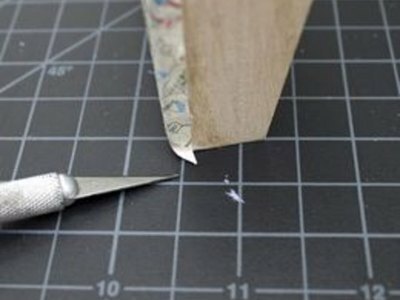 Cut off the excess paper at the corner using a utility knife. Wait for the paper to dry so that it does not tear as you cut it. Paint decoupage medium onto the next side of the box and lay the paper on top. Hold the lid of the box together with the bottom half while you apply the paper. Do not wrap the excess paper over the edge if you have already applied paper to the adjacent side. Wait for the paper to dry for a couple minutes, then cut off the excess with a utility knife while pushing down firmly on the box. Trace the opening of the box with your fingernail to create a cutting line. 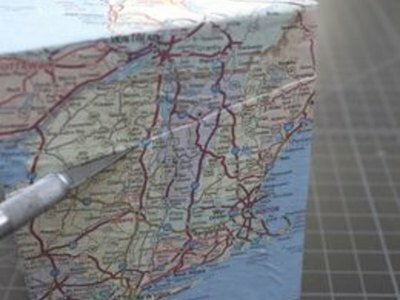 Use the utility knife to slowly cut the paper along the seam so that your box lid will open and have a continuous image on the front and sides. If you make a mistake, re-attach the paper using decoupage medium. Cut out the opening for the hinges with the utility knife. 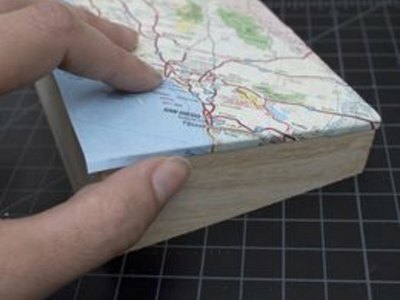 Fold excess paper inward and paste it down with the decoupage medium. Wait for the paper to dry for approximately 30 minutes, then paint a thin coat of decoupage medium on top of the paper. Use the brush to smooth out brushstrokes. Seal the wood inside your box by applying a coat of decoupage medium to the inside. You can also cover the inside of the box with paper following the previous steps. 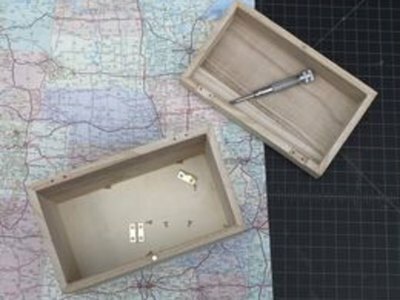 Allow your box to dry and then reattach the hardware. 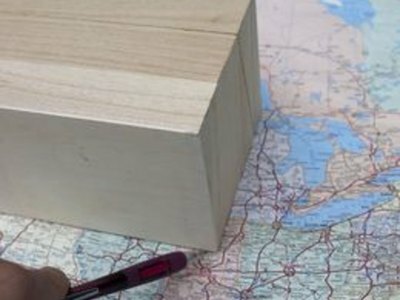 For a different look, start with a painted box and cut out a few states along their border rather than rectangular pattern pieces. If your paper tears or you make a mistake cutting the edges, reapply the torn piece of paper by painting the decoupage medium on top. You can also re-cover the side where you made a mistake with a new piece of paper.